Conjecture: Advanced souls/spirits will carnate on Earth in order to advance human development. From this is is reasonable that Krishna carnated within the living body of Jesus. For clarity, reincarnation presupposes live birth and an ensuing human development whereas carnation supposes combining with a living human and augmenting that human physically to express an aspect of the advanced spirit. These advanced spirits must be the Divas of Indian mythology. This whole cosmology conforms to the comology of all Indo Europeans and Zeus is Indris. Conjecture: Vedic times were the known era of the Atlantean Global Bronze Age of which India was an integral part. Thus Hindu Scriptures are directly derivative of or contemporary to lost Atlantean scripture. A companion of mine is on the path of physical change allowing an expanded access to the spiritual realm. This has led to much mutual guidance as we map the physical aspects of the spiritual. . He has been informed by a Hindu Priest that he is carnating as Lord Indra in a way that makes dispute unreasonable. Thus i am communicating with a soon to be carnate Lord Indra. This is unlikely and unimagined new revelation and serves to police up our understanding of the spiritual pantheon and the five reported tiers of the afterlife.. In Vedic times, Indra was the supreme ruler of the gods. He was the leader of the Devas, the god of war, the god of thunder and storms, the greatest of all warriors, the strongest of all beings. He was the defender of gods and mankind against the forces of evil. He had early aspects of a sun-god, riding in a golden chariot across the heavens, but he is more often known as the god of thunder, wielding the celestial weapon Vajra, the lightning bolt. He also employs the bow, a net, and a hook in battle. He shows aspects of being a creater god, having set order to the cosmos, and since he was the one who brought water to earth, he was a fertility god as well. He also had the power to revive slain warriors who had fallen in battle. Indra is described as being very powerful, with a reddish complexion, and with either two or four very long arms. His parents were the sky god Dyaus Pita and the earth goddess Prthivi; he was born fully grown and fully armed from his mother's side. His wife was Indrani, and his attendants were called the Maruts. His sons are named as Jayanta, Midhusa, Nilambara, Rbhus, Rsabha, Sitragupta, and, most importantly, Arjuna. More hymns in the Rig Veda (about 250) are dedicated to him than any other god by a sizable amount. He was known as a great drinker of Soma; sometimes he did this to draw strength, and when he did he grew to gigantic proportions to battle his enemies, but more often he merely wanted to get drunk. When not in his chariot, Indra rode on the great white elephant Airavata, who was always victorious, and who had four tusks which resembled a sacred mountain. He was given numerous titles including Sakra ("Powerful"), Vajri ("the Thunderer"), Purandara ("Destroyer of Cities"), Meghavahana ("Rider of the Clouds"), and Svargapati ("the Lord of Heaven"). Indra held court at Svarga, his heaven in the clouds surrounding the highest peak of the sacred mountain Meru. This heaven could move anywhere at its lord's command. In Svarga, there is an enormous hall when slain warriors went after death. Indra and the beautiful Indrani presided over their paradise. No sorrow, suffering, or fear were allowed in Indra's home. Apsaras and Gandharvas danced and entertained those who attended court, and gaming and athletic contests were held. Indra's most notable exploit was his battle with the asura Vritra. Vritra took the form of a mighty dragon, and had stolen all the water in the world for himself. No one could do anything about this until Indra was born. Upon hearing what had happened, Indra vowed to take back the life-giving liquid. He rode forth to meet him the terrible Vritra. He consumed great amounts of Soma to give him the strength needed to fight such a foe. Indra smashed through Vritra ninety-nine fortresses, and then came upon the dragon. The two clashed, and after a long battle Indra was able to destroy his powerful enemy. Vritra had been keeping the earth in a drought, but when Indra split open the demon, the waters again fell from the skies. So Indra became a hero to all people, and the gods elected him their king for his victory. In Brahamanic and later times, Indra slowly lost much of his grandeur. He was supplanted by Vishnu and Shiva as the most important of gods. In later versions of the story of his battle against Vritra, he is portrayed as vengeful and cowardly, and needs the help of Shiva and Vishnu to slay the dragon. In the Mahabharata, Indra is pursued by a terrible female goddess called only Brahminicide who rose up out of the dead Vritra, who was a Brahman in that version of the story. She relentlessly chased him and overtook him in his chariot and clung to him so that he could not escape; he hid inside a lotus blossom, but he still could not dislodge her. Finally, he went before Brahma and acknowledged his crime, for the killing of a Brahman was considered a terrible sin, and Brahma agreed to help him become free. The king of the gods had to perform penance to atone for his transgression. Indra also suffered such indignities as Krishna showing himself to be immune to Indra's storm and supplanted himself onto Indra's worshipers. Indra eventually was given the role of weather god and lord of the lesser gods. Lord Indra, the Indian god of rain, is believed to be the leader of all the Devas. He is also the god of war and the greatest of all warriors. Lord Indra is looked upon as the strongest of all beings and ruled thunder and storms. He is the defender of the good against all evils. Earlier he was considered as the sun-god, who rides a golden chariot across the heaven. Later, in Hinduism, he is recognized as the thunder god and storms as he owns a celestial weapon called Vajra. As he brings water to the earth thereby causing fertility he is also regarded as the creator god. Lord Indra is depicted as a fair-reddish complexion with either two or four very long arms. From his mother`s womb he was born as a full grown four armed young man. Indrani is his wife and his attendants are called Maruts. Jayanta, Midhusa, Nilambara, Rbhus, Rsabha, Sitragupta were his sons. 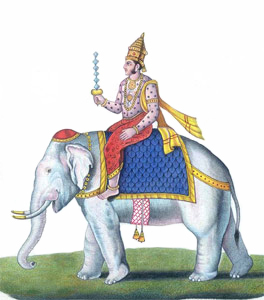 When he is not using chariot he rides the divine elephant Airavata, who has four tusks and looks like a mountain. Indra is known by se veral names like Sakra, Vajri, Purandara, Meghavahana and Swargapati. One of his most important deeds is the slaying of the demon Vritra. As per the legend Vritra took the form of a dragon and took all the water from the world. When Indra heard this he vowed to give back water. Before the battle begun he drank Soma in order to attain power. Indra chased Vritra and after a fierce battle he was able to destroy him. Water fell from the sky when Indra split him open. This made Indra the king of the Gods. Lord Indra was no more interested in wealth and honour. Indra decided to lead a simple life and became a hermit in order to attain wisdom. His wife was helpless and asked Brihaspati the priest to change her husband`s mind. Brihaspati taught Indra the qualities of spiritual and worldly life. Indra learned to pursue wisdom while fulfilling his duty as a king. It is believed that Indra`s weapon, Vajra, is made from the bones of a sage Dadhichi. According to the concept in the Vedas each `Manu` ruled during a longest geographical period is called `Manwantara`. Fourteen Manvantaras make up a `Kalpa`, which was ruled by different Indras. The Svayambhuva was ruled by Yajna, who was an incarnation of Vishnu; in Swarochis the ruler Indra was Vipaschit; in Uttam Sushaanti; in Taamas Shibi; in Raivat Vibhu; in Chaakshush Manojav; in Shraaddhdev Purandar or the present Indra; in Saavarni Bali; in Daksha Saavarni Adbhut; in Brahma Saavarni Shanti; in Dharma Saavarni Vish; in Rudraputra Saavarni Ritudhaama;in Ruchi or Deva Saavarni Devaspati; in Bhaum or Indra Saavarni Suchi. At many times, Indra lost control over the heavens to the demons. So Indra became always watchful to destroy any man or demon that became too powerful. In the Life of Ganga epic, Indra saw King Sagar triumph over all kings of the Earth. When King Sagar decided to organize an Ashwamedh Yagya (horse sacrifice) that would make him emperor of earth, Indra stole the horse and hid it with Sage Kapila, who later burned Sagar's army to ashes. When hungry young Hanuman sought to devour the Sun, Indra hit him with his Vaijra. This angered the father of Hanuman, until Indra agreed to make Hanuman immortal.